The following is basic breed information for anyone who is interested in acquiring a Pit Bull. And for those who already have one or more and would like to learn more about the breed, or simply for anyone who would like to understand these great dogs…..read on. This page discusses the most notable traits of Pit Bull type dogs, including the potential for dog aggression. You will learn here that while Pit Bulls make great family companions while in the right hands and living situation, they require intelligent, responsible and dedicated ownership. Unfortunately too many people obtain these dogs for the wrong reasons or have little understanding on the inherent traits this breed possesses. 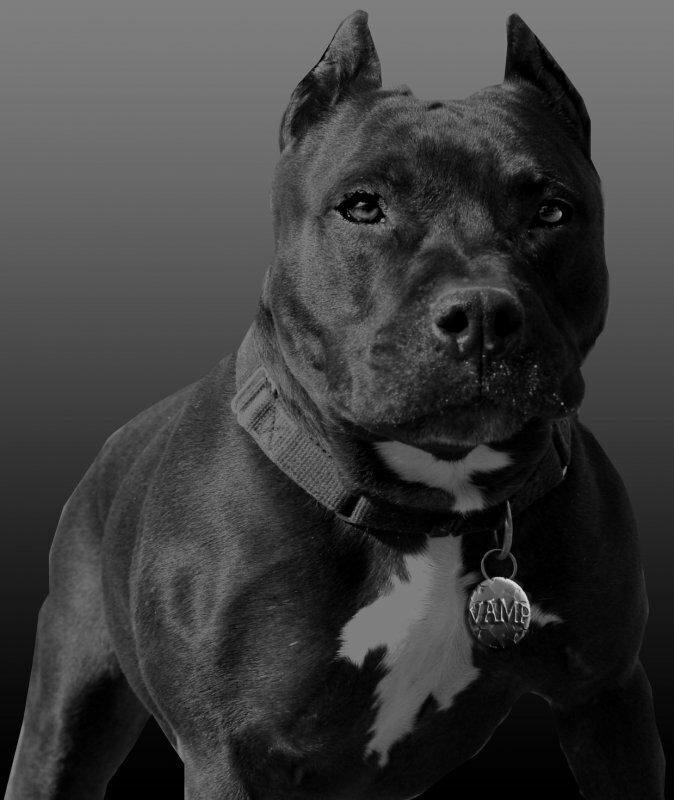 It is unfortunate that one of the original purposes of the APBT was (and still is for many) dog-to-dog combat, but it’s a fact that can’t be denied or ignored. It’s very important that every potential Pit Bull owner, understands the selective breeding that took place to make these dogs of today and the inherited characteristics that are potentially within this wonderful breed. PBRC is committed to informing current and future Pit Bull owners so they will have a better understanding of their dog and will provide responsible and caring ownership. “Pit Bull” is NOT a breed. It is a generic term often used to describe all dogs with similar traits and characteristics often known by the public as Pit Bulls. This article is addressed to owners of any “Pit Bull” type dog including American Pit Bull Terriers, American Staffordshire Terriers and Pit mixes. Remember, that little is known about the background of rescue dogs. Some may be game bred (from fighting lines), some may be registered show dogs, some may be Am. 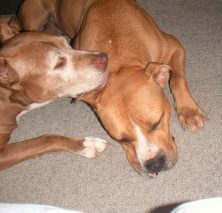 Staffs, some may look like APBT’s, but might be mixed with other breeds, etc. 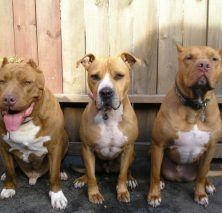 Since there is no way to know for sure unless you have the pedigree of the dog in hand, we recommend the following guidelines offered by PBRC (http://pbrc.net), for any type of “Pit Bull”. Pit Bulls are wonderful animals that deserve a chance to have a good life like any other dog. However, it’s important to remember that Pit Bulls are not just any other dog. They are a little more of everything a dog can be. Pit Bulls have great physical and mental characteristics that make them excellent partners for responsible, active, and caring owners. On the other hand, these same outstanding qualities can make them a little difficult to handle for people who don’t have a lot of experience with dog ownership or for those who don’t understand the breed very well. Luckily, Pit Bulls are very responsive to training and eager to please. It is therefore strongly recommended to take them to obedience classes as soon as they are up to date with their shots. (Pit Bulls are prone to distemper and parvo, so it is important that they receive all their vaccinations before coming into contact with other dogs or going places that other dogs frequent). A well-behaved and obedient Pit Bull will be a great ambassador for the breed and help fight prejudice and misconceptions. Pit Bulls are very adaptable and will even do well in urban living, provided they have enough exercise or other positive outlets for their energy. Many Pit Bulls are easy going couch potatoes, but can also be quite rambunctious until they mature. Maturity can come pretty late with this breed (2 to 3 years old in some cases). Pit Bulls remain playful all their life and have a great sense of humor. These dogs will make you laugh like no other. Pit Bulls are strong, engergetic, agile and powerful dogs. The are also very resourceful and driven. “Determination” is one of their most notable traits. Whatever they set out to do, they will put their heart and soul into it. Whether it’s escaping out of an inadequately fenced yard to explore the neighborhood or destroying your new couch when left home alone or climbing into your lap to shower you with kisses – they just don’t give up easily. Another very important characteristic of Pit Bull dogs, is their amazing love of people. These dogs are indeed remarkably affectionate, and crave human attention. They are wonderful cuddlers and nothing beats a belly rub. In fact, most Pit Bulls think they are lap dogs! Human aggression, severe shyness and instability are not traits typically found and accepted in the Pit Bull breed. Dogs with these traits are not good representatives of the breed and should not be placed in adoptive homes. Like any other breed, Pit Buls can develop behavior problems if mishandled, abused, poorly bred, unsocialized, etc. that could result in inappropriate aggression. Any large, strong and powerful dog that attacks, can do a lot of damage. 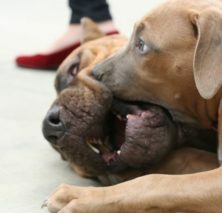 This is why serious temperament evaluation is so important when dealing with dogs of certain size. Unlike the myth propagated by the media, human aggression is not a problem specific to the Pit Bull breed. In fact, Pit Bulls tend to do better than average in temperament tests. The American Temperament Test Society provides testing around the country for dog breeds and provides a passing score for the entire breed, based on the percentage of passed over failed within total number of that particular breed tested. As of March 2001, the American Pit Bull Terrier has a current passing rate of 82.3% which makes him one of the top 5 most stable breed of dog in the country. Pit Bulls make wonderful, loving and very loyal companions. It is important however, to understand the breed’s nature, to provide a structured environment and to establish a positive leadership role. In order to do so, Pit Bull owners must understand the original purpose of the breed and respect it’s limits and potential. Humans have created very specialized dogs through emphasizing desired traits and eliminating unwanted ones. It is no different with the Pit Bull breed. 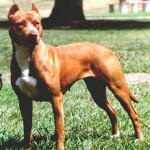 The American Pit Bull Terrier has been “selectively” bred for hundreds of years to fight other dogs. This is the sad “work” these dogs were created for. In the same way that Labradors were bred to retrieve birds, APBT’s were bred to face other dogs in mortal combat. 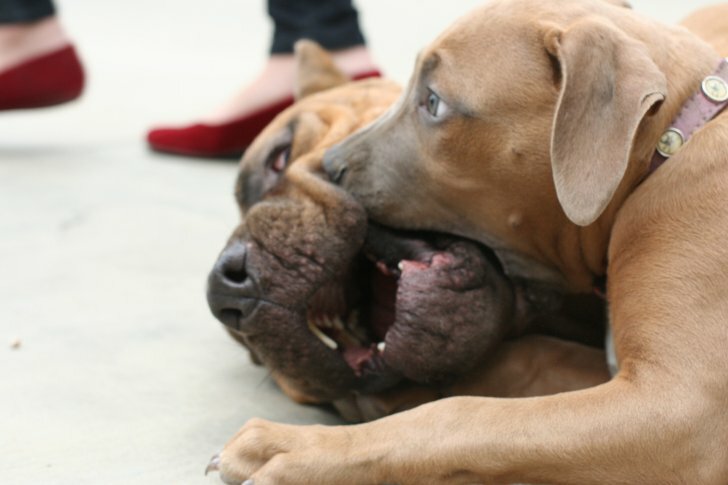 Even in dogs that are not recently bred from fighting lines, the urge to rumble can arise at any time. Not to strongly emphasize this fact is to be negligent. We would be equally negligent if we were placing Beagles and failed to educate the adopter about why the specific traits that scent oriented dogs, hunting dogs, bred to work in packs, present certain challenges to those who wish to obedience train their hound. We can’t blame specialized breeds for behaving like they were bred to do what they do. Certain specific traits were selectively bred into the dogs and are now a part of the breed’s character. It’s like the digging instinct of many Terriers, the herding behavior in Shelties, the compulsion to run in a Greyhound, etc. Your Pointer may have never spent a day on a real “hunt”, but he may still point and flush out a bird as his ancestors were bred to do so. We don’t have to condone or glorify it, but dog aggression is not uncommon with Pit Bull type dogs. Owners must recognize and accept this fact or they won’t be able to provide competent ownership and have fun with their dogs. It’s a mistake to think the fighting gene can be easily trained or loved out of a dog. Or that early socialization will guarantee your Pit Bull will always get along with other animals. Even though PBRC does not in anyway condone animal fighting, it does acknowledge the importance of understanding the special traits of this breed and advocates education about proper and responsible Pit Bull ownership. You can have all the dog experience in the world, but it’s also essential to understand the distinctive features of the type of dog you own or work with. In this case, a dog with an important fighting background who requires extra vigilance around other pets. 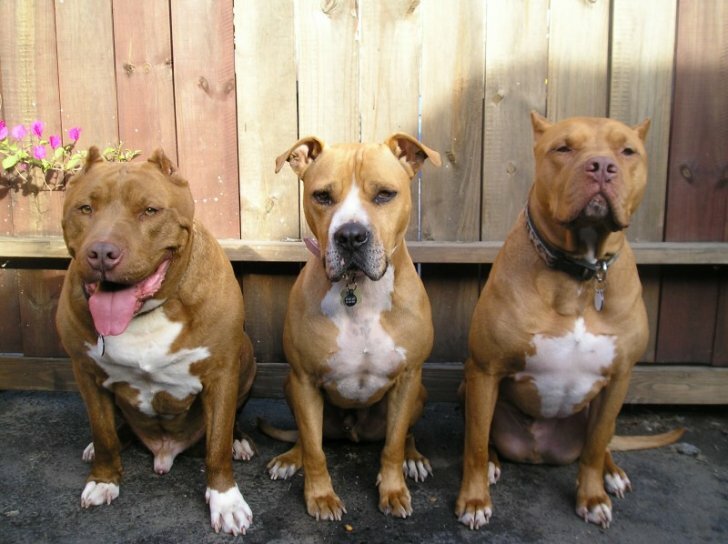 There are precautions to take when owning a Pit Bull, especially in a multiple-dog environment. Unfortunately these precautions are often viewed as an acceptance for the sport of dog fighting when nothing could be further from the truth. PBRC believes that knowing how to avoid a fight, as well as how to break up a fight, can be a matter of life or death for your dog and the “other” dog. T ake note that a fight can strike suddenly and for no apparent reason. Warning signs can be very subtle with Pit Bulls and even completely absent in certain cases. Two dogs may be best friends for years, sleep together, cuddle, play and even eat from the same bowl. Then one day something triggers one of them and BOOM! Often the dogs act like best friends as soon as the fight is over. They might even lick each other’s wounds. You have been warned though. They will do it again and get better at it every time. They had been buddies for years. And then one day, Darla decided she was “mad”. We were only a few feet away, but by the time we got there, they managed to do this to each other. And like the typical Pit Bull, they were silent in their warfare. We never heard a thing. Unlike most dogs who will growl, bark or scream, you will rarely ever hear a Pit Bull in “battle”. For the record, after we “intervened”, they both waited ever so politely for their food and ate like nothing had happened. 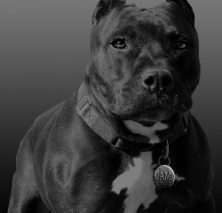 It is not necessarily a hate of other dogs that will cause Pit Bulls to fight, but rather an “urge” to do so that has been bred into the breed for many generations. Pit Bulls may fight over hierarchic status, but external stimulus or excitement can also trigger a fight. Remember that any canine can fight, but Pit Bulls were bred specifically for it and will therefore do it with more drive and intensity than most other breeds. Pit Bull owners must also be aware of the remarkable fighting abilities of this breed and always keep in mind that they have the potential to inflict serious injuries to other animals. A Pit Bull may not even be the one starting the hostilities but chances are he will fight like a pro if he has to. Keep in mind that Pit Bulls will almost always be blamed, no matter who starts it and often end up paying the price at the hands of the authorities. With all that said, some Pit Bulls get along great with other pets and may live happily with other dogs without any incidents. We just can’t assume that this is true for all of them or take it for granted. Pit Bull owners need to have common sense and don’t set their dogs up for failure. Every negative incident involving a Pit Bull adds to the breed’s reputation and jeopardizes our right to own these great dogs. It’s up to you to – KEEP YOUR PIT BULL OUT OF TROUBLE!! In closing, please remember that animal-aggression and people-aggression should never be confused with each other as they are two different traits. Unless they have been very poorly bred and/or specifically “trained” to attack humans (often through abusive methods by undesirable individuals), Pit Bulls by nature are very good with people. They are in fact one of the most loving, loyal, friendly and dedicated companions one can have. Many Pit Bulls are indeed too people oriented to make good guard dogs. Everyone is entitled to their own opinion, as we most definitely have ours. All we ask of you, is to keep an open mind when learning about this breed and understand from beginning to end, what these dogs have endured throughout the years. Before acquiring one of these mighty dogs, please do as much research as possible and make your decision wisely. Serious Pit Bull owners would rather the “bleeding hearts” not take one of these dogs on merely for the fact that they might find that they’ve “bitten off more than they can chew”. As a rescue facility for this breed, that is the most common plea for help we get. Though we so much appreciate any and all assistance, at the same time, ask for help from those who know: “The Real Pit Bull” before your heart is too involved.